Be the first to share your favorite memory, photo or story of Patricia "Pat". This memorial page is dedicated for family, friends and future generations to celebrate the life of their loved one. Patricia Anne Altmaier, died Wednesday, April 10th at the age of 95 with her family surrounding her. A celebration of life will be held 9 a.m. Saturday, May 4th at St. Mary’s Catholic Church, Iowa City. Visitation will be from 4-7 p.m. Friday May 3rd at The Kirkwood Room (515 Kirkwood Avenue) in Iowa City. In lieu of flowers, memorial donations may be directed toward Iowa City Hospice or Grace United Tiffin Methodist Church. Pat was born on October 20, 1923 in St. Paul, Minnesota to Thomas and Lavina Hutchins. She was placed in the Colorado State home for Orphans in 1929. She was in and out of seven foster homes, and the orphanage, until Guy and Lillian Lamb adopted her in 1938, at the age of 15. She graduated from Colorado’s Montrose High School in 1941. In June of 1941, Pat met Cedric Altmaier at the Lamb’s Ridgeway Colorado ranch. They were married in Burbank, CA on November 30, 1941. They bought a farm in Johnson County in September 1945, after Cedric returned from active duty in World War II. It is the current Altmaier Family Park in Coralville. Pat and Cedric raised four children, Cedra, Robert, Elaine and Lois. She kept a large garden, canned all the food, raised chickens and helped with other farm chores. She made most of the family clothes, including beautiful dresses for her three girls. Pat taught herself how to play the piano and was choir director at the Tiffin Methodist church, where she also taught Sunday school. She traveled the world with Sweet Adelines for 25 years. She taught herself shorthand and managed the Gold Bond redemption center at Randall’s supermarket. From there she held a position as Administrative Assistant at the VA Hospital dental department for 25 years. She was remembered fondly by VA staff and students for her pleasant personality, positive attitude and dressing like a model. Her greatest accomplishment was her role as a wife, mother and grandmother. Her grandchildren will never forget all the love, food and caring they received from Nana. She was fondly known as “Sparkle”, not only for how she dressed, but how she lit up the room. She was an inspiration to everyone around her. She was very religious and found strength in her faith. If she was ill, she would just say, “I’ll get better” and she did. Pat and Cedric retired to Silveridge Resort in Mesa, Arizona. 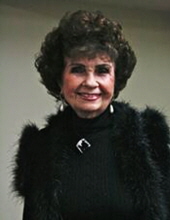 Pat was involved in countless theatre productions and musicals. She leaves behind a loving family who will cherish the time with her and will always remember what a strong woman she was. Pat was preceded in death by her husband of 51 years, Cedric, a grandson Bryan Bulgarelli, son-in-law Douglas Williamson, her parents and four brothers. She is survived by her children Cedra Williamson, Robert Altmaier (Patty), Elaine Haddy, (Phillip) Lois Crowley, (Edward), eight grandchildren, Vaune Bulgarelli-Beckmann, Matthew, Michael and Michelle Altmaier, Jason Haddy, Jamie Powers, Amie Villarini and Marie Crowley. Eleven great grandchildren, Alec and Nate Beckmann, Sarah Rundlett, Zachariah Scritchfield, Jake Altmaier, Nicholas and William Haddy, Evelyn and Marty Powers, Eleonora and Camilla Villarini. Pat’s motto was to “Turn the Page” move on to a new day and don’t hold on to the negatives. If you do that you will become a better person and live a life full of love. The Kirkwood Room is located in the red brick building next to Lensing Funeral & Cremation Service, Iowa City. Parking will be available along Jefferson Street and at Paglias Pizza Parking lot. "Email Address" would like to share the life celebration of Patricia "Pat" Anne Altmaier. Click on the "link" to go to share a favorite memory or leave a condolence message for the family.